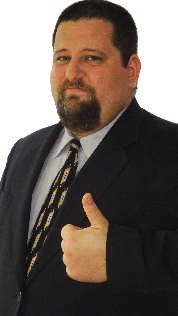 I am a business technology expert, consultant, tech-philosopher, and author. I find it amazing that we're supposed to summarize who and what we are in under 140 characters. It's as if we are all required to have a personal elevator pitch. In my work, I am a business technology consultant. I engineer solutions for my customers based on their business goals and needs. I try to get to know my customers and understand their challenges. I've never understood those consultants that barge in and start making changes before taking the time to study. And yet I see it too often. I don't shill or push any specific product. I am platform agnostic, meaning I hate all computers equally. Windows, Mac, Linux and the Cloud are all within my experience and I'll work with the right tool for the job. What this means is I'm not going to shoehorn your business into something that isn't right for you. I admit that my approach takes longer. However our results speak for themselves. The IT industry has become a joke. More than 70% of IT projects fail and 90% of IT workers have no idea of business goals. That is unacceptable and that's why we do what we do. By learning your business we get the chance to understand your unique challenges. No two businesses are the same. We get it. Don't worry! This doesn't mean that we stand around drinking coffee and collecting checks for months before we actually do anything. While we learn your business we're also maintaining and updating your computers, servers, networks, software and even your service contracts. By the time we have your systems running to our standards we'll have a much better understanding of your needs. Click to learn more about my business, R-Squared Computing. My new book, Firm Wisdom is available now. There is a powerful knowledge asset in every business that is completely untapped. With some modern software tools and a little guidance, you can start reaping the benefits of that knowledge immediately. Just visit FirmWisdom.com to order your copy today. 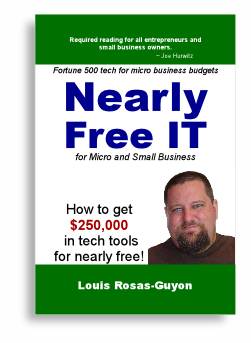 My first book, Nearly Free IT teaches small businesses how to eliminate their technology costs while still getting Fortune 500-grade tools. Sound impossible? Don't believe it? Fine, go download it now for free. No email address required. Just visit NearlyFreeIT and download your free copy of the book today. You'll start saving money immediately. This blog, The R-Squared Method, is published mornings on Monday, Wednesday and Friday whenever I have something to say. I won't fill this blog with noise just for the sake of meeting a publishing schedule. I write on a wide range of subjects but mostly focus on business and technology. I write about entrepreneurship and useful software tools that I find. Unlike many bloggers, I do not check my following with any frequency but I do make a point of responding to every email and comment personally. I write mostly as a way to clarify my thinking. When I have a new idea that I want to develop, I will write about it here. When I have something I am trying to grok I'll write about it. When a particular insight strikes me, I'll write it here. I might even start posting some of my crazier, mad scientist ideas too. I recently started speaking about business and technology. I have been honored to deliver several guest lectures at local colleges, and speeches to local clubs and organizations. I enjoy public speaking and so far no one has thrown any rotten tomatoes. To learn more about my speaking check out my personal website. In my personal life I am a husband and father. My family is the greatest part of my life. I derive my joy from my children and my inner compass from my wife. I enjoy traveling, reading, barbecues, swimming pool parties, good cigars, better scotch, and American football. I hope you enjoy my blog. If you like what you read, please be sure to subscribe by using the options in the upper right hand corner of the screen. Also, please feel free to leave your comments. I always enjoy exchanging ideas.